10 Kitchen Gadgets Under $10! You are here: Home / Great Deals / Amazon Deals / 10 Kitchen Gadgets Under $10! Looking for some gadgets to make cooking easier but don’t want to spend a lot? You’re in luck – we have some great kitchen gadget suggestions for your in our roundup of 10 Kitchen Gadgets Under $10! Carrot and Cucumber Peeler – $2.09 + FREE shipping! 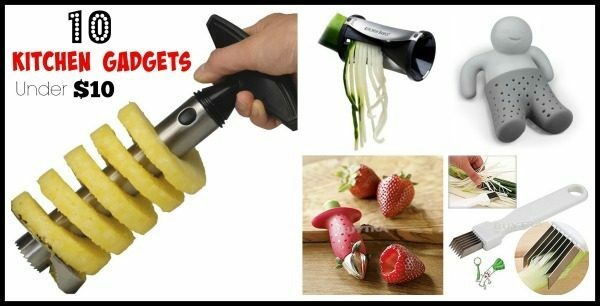 Vegetable Cutter – $2.43 + FREE shipping! Strawberry Hull Remover – $2.59 + FREE shipping! Egg White Separator – $3 + FREE shipping! Egg Boiler – $5.38 + FREE shipping with Amazon Prime or Super Saver Shipping! Pineapple Easy Slicer and De-Corer – $5.60 + FREE shipping with Amazon Prime or Super Saver Shipping! Knife Sharpener – $5.99 + FREE shipping with Amazon Prime or Super Saver Shipping! Fred Mister Tea Infuser – $7.15 + FREE shipping with Amazon Prime or Super Saver Shipping! Baker’s Secret Nonstick Cooling Racks (2 Pack) – $8.04 + FREE shipping with Amazon Prime or Super Saver Shipping! Kitchen Basics Spiral Vegetable Slicer – $8.95 + FREE shipping with Amazon Prime or Super Saver Shipping!